Brønderslev, a Danish municipality with a population of 12,500, is setting up a multi-purpose renewable heat plant for their district heating network. So far, local utility Brønderslev Forsyning has been operating seven gas-fired combined heat and power (CHP) plants and two gas boilers to produce 130 GWh of heat each year. In the future, most of the yearly district heating demand is planned to be met by a new Organic Rankine Cycle (ORC) unit which receives its energy from two wood chip boilers (10 MW each) producing 17 MWth and 3 MWel and from a 16.6 MWth parabolic trough collector field with a mirror area of 27,000 m². The crucial factor will be the performance of the concentrating collectors, which require direct irradiation in a northern European climate. The Department of Civil Engineering at DTU monitored and evaluated an Aalborg CSP pilot plant in Thisted, Denmark, in July 2013. Operation at up to 350 °C was later investigated during a pilot test in Brønderslev in 2015. The results were presented at the Eurosun Conference in October last year (see the table below). The researchers have found that even if direct radiation is as low as 100 W/m², net production will remain at 57 W/m² (calculated based on 100 W/m²*0.75 – 0.06 m²/k*300 K). The system can deliver 300 °C at low DNI, mainly because of the selectively coated vacuum tube absorber, a precise tracking mechanism and a rigid enough mirror, so the conclusions of the researchers. Additionally, the support frame kept the focus on the receiver at all times. The parabolic trough collectors can produce steam at around 300 °C to generate electricity and heat in the ORC system or feed low-temperature energy into the district heating network and its 8,000 m³ storage tank. To retain flexibility throughout the year, Brønderslev Forsyning has decided to install two smaller boilers (10 MW each) instead of a large one. And the high cost of energy in Denmark has resulted in a thorough optimisation of boiler and flue gas processes. For example, the system has three heat pumps driven primarily by cooling energy from the fuel gases. In total, these pumps add more than 2 MWth to heat output and increase the overall energy efficiency of the biomass power plant to a stunning 118 % (based on direct calculation) – without the input from the CSP field. 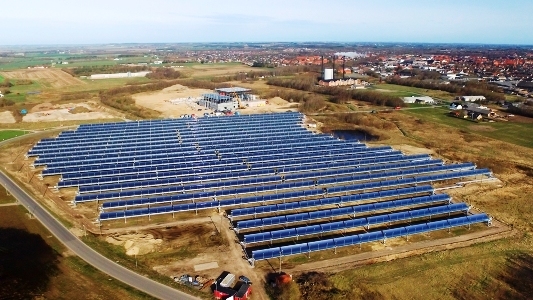 The innovative design of a system producing solar-biomass heat and electricity was supported by the Danish government´s Energy Technology Development and Demonstration Programme. 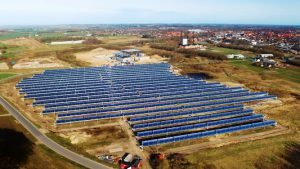 An Aalborg CSP press release from 20 April 2017 read that it would be the first large-scale combination of a CSP field for optimising ORC efficiency in low-DNI regions. Since 2013, Brønderslev Forsyning has also been operating a 20 MW electric boiler for using wind power to produce heat in surplus situations. “In 2015, we had an extraordinary year, as the electric boiler alone covered more than 20 % of annual heat consumption. In 2016, it met about 10 % of demand,” said Neergaard. Brønderslev Forsyning is planning to add an education facility with a workshop room to the new installation, with the intention to teach students about ORC. “Part of it will be the students’ use of real-life data taken directly from monitoring and control units and its integration into theoretical exercises and study projects,” added Neergaard.